Jude's Foods: What's the Secret to Your Success? 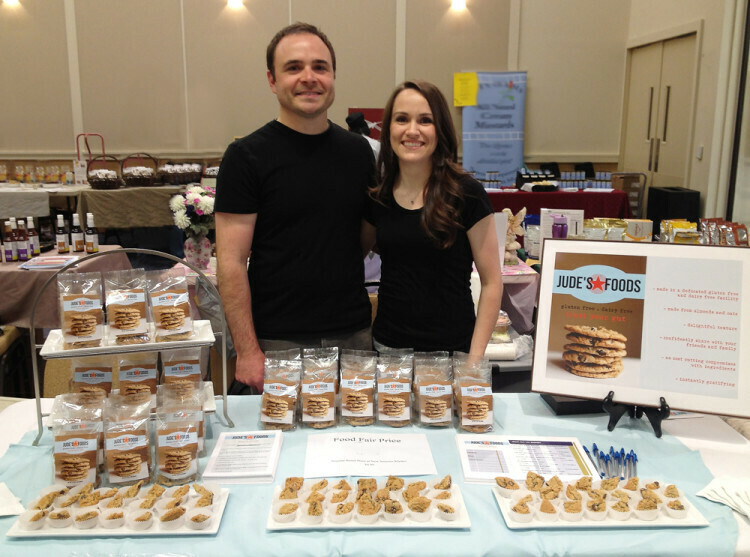 Josh Fegles and his wife Bethany selling Jude’s Foods at an industry event. Husband and father of three Josh Fegles loved to bake, and his family had recently gone gluten-free. They were all fond of cookies, and the existing gluten-free cookie options were just missing the mark of what his family was used to eating. Josh started experimenting with gluten-free cookie baking to try and recapture the taste he and his family had loved. Eventually, he hit on a recipe that was so good, a family member in the catering business suggested he start selling them. The Fegles jumped into the project, and Jude’s Foods was born. The company is named after their son Jude, who was experiencing health problems before it was determined that he should be on a gluten-free diet. Like many parents these days, Josh and his wife Bethany realized that it would be a battle keeping the house designated into gluten-free and non-gluten-free areas, so they all got on the bandwagon and kicked gluten to keep things simple. Josh has a lot to tell new entrepreneurs about what to expect from starting a business in the food industry, and how to maintain that ever-elusive work-life balance. Was it always your plan to be an entrepreneur? For me personally, I never wanted to be an entrepreneur. I was always the company man and I love clocking in, showing up, getting the job done. My wife is an entrepreneur personally, she has her own business, but for our dynamic, it’s very settling for her to know that I’ve got a good job and it’s very predictable. She had no aspirations for me to be an entrepreneur, even though she was one. I discovered entrepreneurship in a way by accident, because I had made this great cookie on a whim, really. I thought, “Oh yeah, I should try and sell it,” and I didn’t really know what that meant. I googled “How do you sell a food product?” That’s what got me connected with Oregon State University’s Food Innovation Center and Portland Community College’s Small Business Development Center. I discovered a course called, “Getting Your Recipe to Market” which was exactly what I was looking for. It was the expertise available through each of these resources that launched me into a place of knowledge, understanding, and being able to take action. The way the SBDC works is they’ll partner you up with people who have done what you’re trying to do. One advisor that I had for a couple of years, she was very experienced with her own food company. As I was figuring out how to go from being a small to medium sized business, find a contract manufacturer and then negotiate a partnership with them, and ask the right questions and understand all of the details, my advisor and I would meet and come up with a game plan. Why did you guys pick cookies? It was a fairly natural evolution. We had been gluten-free for a year before starting our company, and that first year for us was an entirely new lifestyle of figuring out how to eat and cook. I’ve always loved baking cookies. Without any business aspirations, I dove into that new lifestyle and diet with a determination to make something that I really liked and wanted to eat. The gluten-free palate is very different than a regular palate. When I first started trying the different textures and tastes, it just wasn’t appealing. The way that our cookies came about was, with a little bit of determination and stubbornness, I wanted to use flavors that really tasted like cookies to me. Gluten-free oats and almond flour are safe for people on a gluten-free diet, and those both sounded like ingredients that belonged in cookies to me versus rice, beans, potato or a lot of the more common gluten-free flavors. So that’s what we use, and just very naturally we, out of our own life, created a great product. Where did you come up with the name Jude’s Foods? It’s so fitting because a special part of our story about our son Jude is that he’s on the autism spectrum and he’s got sensory processing disorder. It took us a while as his parents to figure him out and once we tried a gluten-free diet for him, a lot of the way that he engaged with the world settled down. He previously had been a pretty crazy kid. Going gluten-free just made him super sweet. That’s why we thought it was just so fitting. He was sort of the catalyst for our family to go that direction. 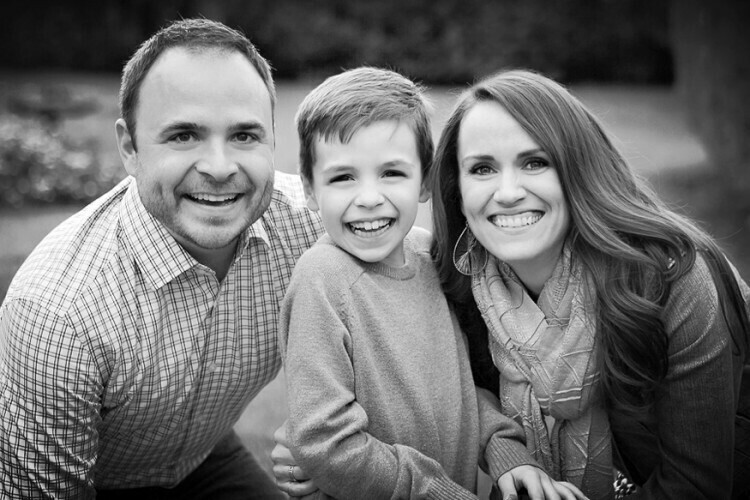 Josh, pictured here with his wife Bethany and son Jude, the inspiration for the company name. How do you do it all, with a day job and three kids? When you have a clear vision or goal of what you’re trying to accomplish, if that’s strong enough, then that becomes the compelling motivation to push through the ups and the downs, the good and the bad. So there were times, a number of times, where my wife and I just said, “We should quit. This is too much.” We had our third baby a month after we launched our product in New Seasons Market, so we were in the throes of being busy, a lot on our plate. We took a step back and thought: “Who can we look to for help? What resource can we get involved with that can get us through this point?” Thankfully, there was always some critical new energy or new advice or help from family that would get us past that tough phase, and then we’d just keep going. My big takeaway on my experience is how invaluable it is to reach out for help; to family, experts, seeking resources, getting mentoring and all of those things, versus trying to go it alone. What is it like starting a business in the food industry? I was definitely the inspired entrepreneur who launched without a plan. A lot of the business skills I have acquired over the years, first through the “Getting Your Recipe to Market” class that was like a boot camp of information about entrepreneurship in the food industry, and then ongoing advising appointments from the SBDC and their consultants, basically took me step by step through the process of not only growing my business, but growing as an entrepreneur. The class was about a three month class, and then after it was over I took those next steps to get my LLC and my bakery license from the Oregon Department of Agriculture. I also officially got a UPC and my nutritional label. The FDA requires standard nutrition labeling on all retail products, and most retailers require an official barcode, or a UPC. You have to go through the process of making sure that you meet all the specifications of what you’re stating about your product, so that it meets FDA requirements. If you miss a requirement or you don’t do it officially, they could pull all of your product until you correct it, which would be very costly. I also went through an organization called the Food Innovation Center that’s an extension of Oregon State University. They are a food science lab. They’ll run tests on your food product for acidity, water content, and all of the different factors that could cause it to spoil, for shelf life testing. Everything started with just my wife and I, and then when we moved to a commercial space, we gained more capacity. That’s when our extended family got involved; our siblings and parents. We have never hired any employees. It’s all been family owned and family run to date. How did you manage to find a gluten-free space to make the cookies? I ended up going to a gluten-free expo with a lot of different gluten-free vendors. I went in with the purpose of networking and finding someone who I could rent kitchen space from in a gluten-free facility. Once we did that, I met a gluten-free bread company. We didn’t have any competition with each other because I sold cookies and they sold bread, but we were both gluten-free so we could share the space. New Seasons Market is a pretty prestigious grocery for natural and health foods. How did you get into New Seasons so early? It was the community college course I took. In addition to all the training they give you, they are in a partnership with New Seasons Market. What New Seasons does at the end of the program is give folks an opportunity to simulate a buying experience where you sit down with actual New Seasons buyers, and pitch your product. They give you advice and feedback on your product. They also have the opportunity to invite you to start selling in their stores right away. After that buyer experience, they invited us to sell our cookies in their stores. The typical path for food entrepreneurs, would be to start at the local farmer’s market, generate a lot of word of mouth, that sort of thing. We got to fast forward past that phase, right into retail, which is where we’ve been ever since. Jude’s Foods logo, designed by Bethany Fegles. There are a number of challenges. One is to find a dedicated gluten-free facility. If you have allergen-free products, you have to make sure that either the whole facility is allergen free, or that the facility adheres to manufacturing practices to ensure that there isn’t any allergen contamination. Early on, it felt like there was nowhere we could find, then of course we did. The biggest challenge was doing it all nights and weekends and everywhere in between, having a young family, working full time, with my wife also being an entrepreneur. It’s settled down a little bit since then, which has been great! Are you still making all the cookies yourselves? We did bake for three years. We’ve now got a manufacturer that partnered with us, and we don’t deliver anymore, we’ve got a distributor. Their reach is much further than my reach could be. It’s local, so I’ve been able to go and meet them and tour the facility, and Jude’s Foods is supporting the local economy by partnering with other local businesses. A huge milestone for the business was to get to the point where my role is someone who manages a business rather than someone who bakes. How do all of the ingredients get to the facility? Do you order them and have them sent there? A little bit of both. A lot of contract manufacturers also source ingredients so you have the option to buy ingredients through them. You can also order exclusive ingredients they don’t keep on hand, and have them shipped and stored. Now that you’ve got everything in place with manufacturing and distributing, how involved are you in the business? I’m still as involved as ever, but my role and focus has now shifted toward sales and marketing as well as managing business operations now that I’m not personally baking and delivering cookies anymore. I have more of a honed focus now on developing and growing the business so that we can expand our product line and share our cookies with even more people than ever. Are you guys tracking your business financials? Yes, I think it’s helpful when you’re creating something new and you’re new to entrepreneurship. So much time and energy goes into what feels like an experiment, because you’ve never done it before. Being able to to look at a spreadsheet and just say: “Reality check. Where are we at?” That’s incredibly helpful. Also, knowing the difference between fixed and variable costs. One of the things that is exciting about scaling is that your fixed costs become a smaller percentage of your overall expenses as you grow. When I first started out, $100 to $200 was a lot of money, and now it’s not, so your fixed costs stay the same, and that helps your margins as you grow. What makes running a business worth it? I’d say the greatest reward is interaction with the customers, when you actually get to give them a sample, hear their story, and then get their response. With our product, it’s unique in the market because of the flours that we use, so it surprises people. A lot of times there are assumptions coming in to a sampling about what gluten-free food tastes like. That’s really rewarding when people emphatically are surprised and excited about what they just tasted. Find your local SBDC and industry association. Industry associations and business development centers are going to be incredibly supportive and helpful. Don’t do it alone. Seek out resources. Look for people who have the heart of a mentor that want to give back and then take advantage of that mentoring opportunity in a really positive way. Accounting software is a no-brainer for small businesses; you’ve got to keep things organized. Josh uses QuickBooks Online, a popular tool and one that conveniently integrates with LivePlan so your financials are always updated and relevant. Specifically for the food industry, Josh likes FoodBiz Startup, a site with great industry-related data and an online community for industry entrepreneurs. In general, Josh recommends getting involved with your relevant industry associations for networking and educational opportunities. For Jude’s Foods and businesses like it, that means Gluten Intolerant Group and Specialty Food Association. Josh’s class at Portland Community College were a huge part of Jude’s Foods success; here’s a link to that class that helped get Jude’s Foods into retail stores: Getting Your Recipe to Market. Josh can’t say enough positive things about his experience with Small Business Development Centers. He suggests finding one in your area. Million Dollar Cup of Tea by Tedde McMillen is the story of a familiar brand to many: Oregon Chai. It’s a true entrepreneurial tale of a mega-successful mother and daughter startup. Start: Punch Fear in the Face, Escape Average, Do Work that Matters by Jon Acuff is, as you might imagine, the book to read if you want to light a fire under your tail to get things done. It’s a look at how the path to success has changed in modern times and what actionable tips relate to that. Part business advice, part self-help, part psychology, The Magic of Thinking Big by David J. Schwartz, Ph.D. explains that what and how you think about yourself can determine what happens in your business—and in your life. To Sell is Human By Daniel Pink does just what you’d think from the title: relate sales to pretty much every job and walk of life a person has. This is a good one for those who are looking to start selling smarter, or who might be uncomfortable with the idea of selling in general. First, our success starts with our openness to the expertise of others. Success is rarely a solo adventure from my experience. From the outset I relied on family, friends, industry experts, and others who have expertise as successful food entrepreneurs. Stay teachable and always remain willing to learn and adjust on the go. Second, is has to be simple patience and persistence. Many people see the flashy startups that blaze to the top seemingly overnight. Certainly that does happen, but those are the exceptions. Most of us find success through faithful dedication to putting in the hard work, the late nights, the long hours. Rarely is it “being lucky” that leads to business success. Last, it helps to have a really great product! But beyond that, I’ve learned to identify and share what makes us different. In a way, every product on the market is great, in its own right. But identifying what makes us unique, and sharing that with everyone I can, has helped set us apart as something special. You’re not going to find a cookie on the market like ours. What is the secret to your success? Share your story with us!